In an unusual form of race report, I’m going to take you through my thoughts about the day and the 2014 La Habra 10K as it unfolded for me. Midnight: Darn it, why can’t I sleep? I must still be winding down from seeing Divergent. Dang that movie was tense. Good thing I slept nine hours last night. 5:30 a.m.: I see Mike is up for his zombie run. I’m glad I don’t have to get up yet. I hope my oldest girl isn’t too mad about getting up that early! I hope she has fun! 6:00 a.m.: Wasn’t it just 5:30 a.m.? Time to get up. It’s still dark out. I hope the younger girls aren’t mad. 6:05 a.m.: Thank goodness the 9-year-old woke up the 5-year-old for me. I love having older kids. Oh look, she even got her dressed! Bonus! Man, I should have shaved my legs last night. Do I care enough to shave them now? No, and besides, it hurts when you sweat on newly-shaven legs. 6:15 a.m.: Coffee with cacao powder. Yum. Oatmeal all around. The oatmeal tastes good, not like cardboard, I must not be too nervous. 6:45 a.m.: Sunscreen? Water? Garmin? Race belt? Timing bib? Sunglasses? Bathroom trip number 4? We should be out the door by now. 7:00 a.m.: Darn it, Mike took my car. Back inside for his keys. Let’s go girls! The race starts at 7:30! 7:10 a.m.: How awesome is it that this race has child care for the kids while the adults race? Oh look, they get to make Rainbow Loom bracelets! And bounce in the bounce house! They’ll be fine without me. Gear check. Easy peasy. Time to warm up with a slow jog and a few strides. Now I’m really feeling those race jitters! 7:20 a.m.: The diaper dash is done and it’s time for the Kids 1K. Oh look, a girl won the race, just like at the Encinitas Mile! Love it! These kids are so cute! 7:30 a.m.: National anthem. I promise to put my hand back over my heart after I check that my Garmin is working and ready for the race start! 7:35 a.m.: Lining up by mile times. How cool is it that I know my mile time is 6:34?! I love that I ran that Encinitas Mile. Okay, that lady cannot run a 6:34. I love a local, small race but I wish people would follow race etiquette! Just chill, don’t say anything. 7:36 a.m.: We’re off! Don’t get trampled in the first turn at the end of the parking lot! Here comes the first steep hill! If there ever was an incentive to go out slow and steady, this is it! Round the corner and up another, more gradual hill. Running Mile 1: I knew this race was hilly — I did the La Habra 10K before back in 2012 — but dang it’s hard to pace myself correctly with these hills! I need to keep the pace under 8:06 to PR, and under 8:02 to break 50 minutes. The race calculator said that based on my mile time I could race a 10K at 7:37, but that assumes a flat course, and this ain’t flat! Just keep it under 8:00. Well, under 8:00 average. Running Mile 2: You can go over 8 on the hills. But not by much! Book it on the downhill! Relax your shoulders! Remember how it looked like your shoulders were hunched up by your ears in your Encinitas Mile photos?! Relax your shoulders again! Unclench your fists! This is the hardest mile on the 5K loop. Don’t burn out, just pay attention to your form. Watch out for the kid who keeps sprinting and then walking. How cool that that guy behind me just started coaching that kid! THAT is why I love a small, hometown race. Running Mile 3: Okay, this is better. Plus the crowd is thinning out. Hey, that lady just complimented me! We’re keeping pace. Yes, I can tell you our pace! It’s 7:27. Yay for the downhill! Are you running the 5K or the 10K, ’cause I’m running the 10K and if you’re running the 5K, you’d better book it, don’t stay with me because I’m running an even pace for the 10K! We’re almost there, good luck! 3.1 Miles, End of First Loop: Hey, I think I just got a PR in the 5K! [Yes, chip time 24:08, a one second PR! Every second counts!] I hope I didn’t go out too fast. Oops. But I feel good. Now let’s see how I handle the hills on round 2. Running Mile 4: Breathe. Keep a quick turnover on your feet on the hills. Even effort, not even pace on the uphills. Let your legs go on the downhills. My legs feel great, it’s my lungs that are dictating the pace! Running Mile 5: Darn mile 5. Good thing I remember from mile 2 how hilly this is. Just keep it as close to 8 as possible without burning out. Running Mile 6: Shoot, that lady passed me! And I don’t think I can pass her back. I hope she’s not in my age group. I don’t think so. [Nope, she’s in 30-34 and I’m in 40-44]. I’ll try to stay as close as possible but run my own race. I know I’m doing my best. Maybe I can pass that older guy who keeps walking on the hills. I’m not gaining ground on him though. Last 0.2 Miles: I can see the finish line! It’s a straightaway here through the parking lot. Don’t trip on the speed bumps! It would be so awful to face plant on the asphalt! Sprint! Don’t throw up! Does the clock say 49 minutes? Yes it does! You’re going to break 50 minutes! RUN! There’s that lady who was running the 5K! How sweet of her to say “There’s my friend!” and cheer me on! Finish: My Garmin says 49:02 for 6.35 miles. Way to run the tangents there, NOT! An extra .15 miles. It didn’t help that you ran into a wall of 5K walkers at the 5-6 mile mark. Oh well! You got a PR! Hey, there’s that guy you tried to catch. Fist bump! Good race! Nice to meet you, Ming! Ooh, banana and oranges and water! Cookies from Corner Bakery — better save those for the girls. I should say hi to that lady, too. Nice to meet you, Julie! How’d you do? Good job! Let’s check our times. The 5K split is posted. I did PR in the 5K! Oh they’re announcing the 10K awards. I wonder if I won an award in my age group. There’s the medal table. The lady says my name’s not in the top 5? Bummer!! Oh wait, that was the 5K list, I got first in my age group in the 10K! No matter that there were only four of us 40-44 year olds in the race, I got me a “golden medal” as my youngest would say. Plus 6th place female overall. And my official chip time is 49:03 for a big fat PR by 1 minute, 23 seconds. That’s a 7:53 pace. Man, I wonder what I could do with a flat course? I want to run another 10K! And a 5K! I bet I could break 49 minutes in the 10K. Just 4 seconds to shave off, I could do it! Photo compliments of my 5-year-old. Overall Race Review: The La Habra Races (Diaper Dash, 1K, 5K and 10K) are great hometown races that benefit some wonderful local causes: The Children’s Museum at La Habra, The City of La Habra summer concert series, and the La Habra High School Cheerleaders. Packet pick up is easy the night before and also available on race morning. I paid an extra $12 for the tech shirt upgrade and it’s a really nice, black long-sleeved tech shirt, plus I still got the regular, white cotton race shirt. The race volunteers and police support on the course were great. I could not have been more impressed by the timing company. I’ve never seen results posted more quickly at a race and especially online. By the time I got home at 10:30, all the results from the 5K and 10K races were up. Nice work, Gemini Timing! I have also never been to another race that offers a Kids Club while the adults race. My kids loved it — both the activities they got to do and seeing the runners race. This is a hilly course, a challenging course, but a fun and well-organized race! 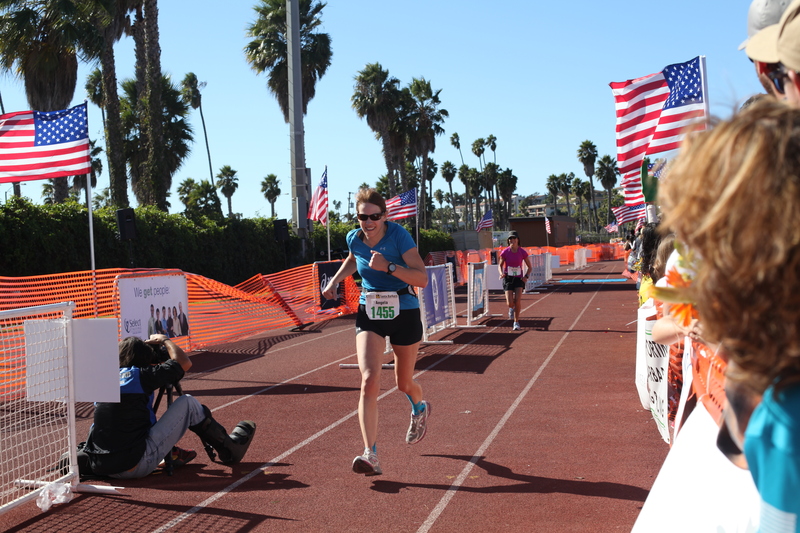 You can read about the fabulous start to my third full marathon in Long Beach Marathon Recap — Part I. As you might recall I’d run the first half of the race in 1:51:57. My goal for the race was to beat my personal record of 3:57:29 from Mountains2Beach. In order to do that I’d need to run the second half in 2:05:31 or less. The first half of the Long Beach course is so nice that it’s no insult to say that the second half is not as spectacular. On this section you’re running through a nondescript part of the city. I simply focused on keeping pace and running steady. Around mile 17 you enter the Cal State Long Beach university campus. It’s nice to see some college kids out early on a Sunday morning to cheer on the runners. Unfortunately that hill during mile 18 is tough. On the plus side I used the subsequent downhill to pick the pace back up and break through the wall that I started to hit around mile 18 in my last full marathon. Here you’re passing back through that same part of town. It got harder and harder for me to keep running strong around mile 20. I wouldn’t say I hit the wall though, because when that happened in my last full marathon my times dipped into the 10s and 11s, whereas here I managed to stay in the 9s. 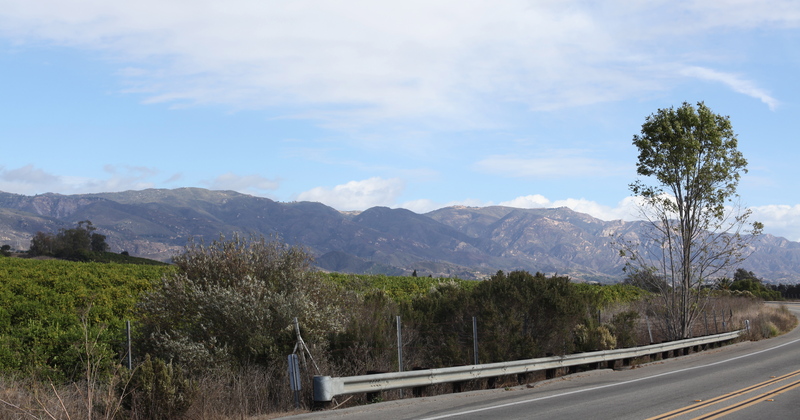 There is a steep, quarter-mile hill as you approach mile 21. I am actually pleased to see that split of 9:06 for that mile. I struggled to take in liquids around this point, both because my body was tired of drinking that much and because I was working so hard by this time that I was having trouble catching my breath after running and drinking at the same time. Somewhere around mile 21 I made the executive decision to walk for about 5 seconds every mile so I could drink a few much-needed sips of sports drink and then resume running. I have no shame about not running the whole way and in retrospect I consider it a very good decision to adopt the strategy to walk for my fuel breaks. I also grabbed a couple of cups of water on the run and dumped them over my head. The sun was out in full force by this time and I was feeling the heat. Right before mile 24 the full marathon course joins back up with the half marathon course at its 10.5-mile point. I’m sorry to say this about what is overall a very nice course, but this joining back up with the half marathon course just plain stunk. By that point in the half marathon race I’d say the vast majority of half marathoners were walking. Maybe it just seemed like that to me in my frustration with the giant sea of people in front of me. It was such a tough time in the race anyway and it was not fun to deal with having to dodge people who were walking in the middle of the course and did not have the courtesy to walk to the right-hand side. In spite of the crowds I managed to pick the pace back up a bit for mile 26. I basically told myself to embrace the pain and let my legs go. It was a huge relief when the course split off into two different chutes just before the mile 26 mark and very few runners split off with me to the full marathon chute. 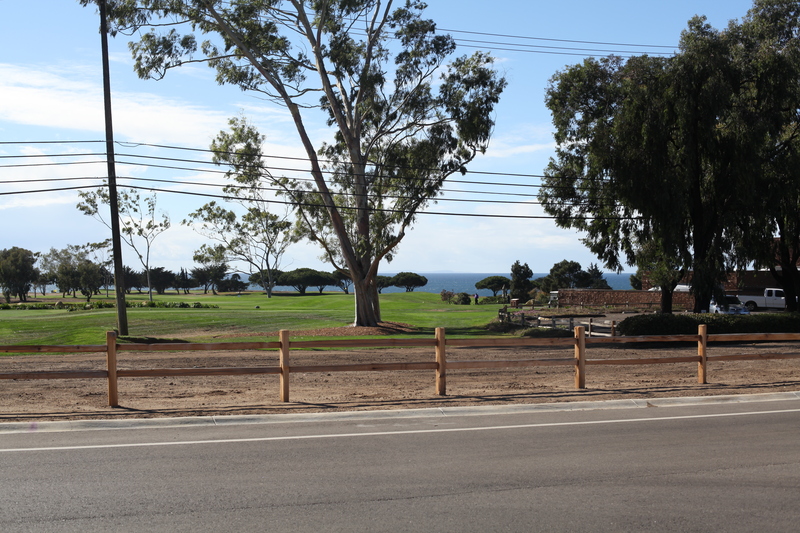 At that point the course turns off Ocean Boulevard and heads down a very welcome hill right into the finish chute. I turned on the speed and with a huge kick at the end I brought my pace down into the 8s. I felt like I was flying at the finish and it was wonderful to hear the announcer say my name! Of course as soon as I crossed the timing mats I came to a stumbling stop and could barely walk. Funny how you can run at what feels like a blistering pace for 26.2 (or 26.44 miles by my Garmin) miles and yet struggle to walk as soon as you stop running. I was so thrilled to be done that I forgot to stop my Garmin until after I got my medal. I knew I’d beaten my former personal record of 3:57:29 but I wasn’t quite sure by how much. My watch said 3:54 something by the time I stopped it. I later got an email from the timing people saying my time was 3:53:27, but it turns out that was my gun time and my official net finish time was 3:52:42! That’s a PR by 4 minutes 47 seconds. That might not sound like much but it’s huge for me. My goal pace for the race was 8:35 and I ended up averaging 8:52. I achieved my “A” goal of running a personal best time, and also achieved my “B” goal of not bonking. While I ran the second half of the race significantly slower than the first (about 9 minutes slower, in 2:00:55 compared to 1:51:57), I wouldn’t say that I hit the wall, certainly not anything like I did in my second marathon. Best of all, I met up with my family and I felt well enough to walk back to the hotel with them without visiting the medical tent this time. 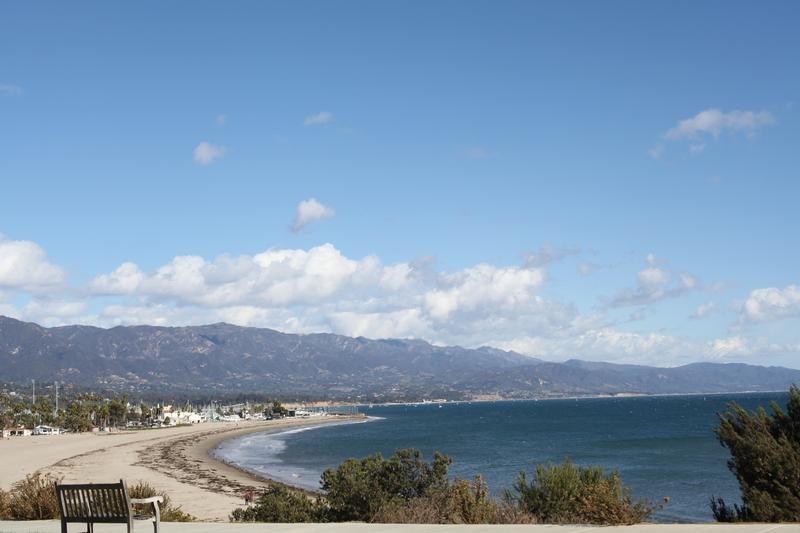 I now believe that the uncontrollable shaking I experienced in Ventura after Mountains2Beach was due to underfueling. This time I stuck to my pre-race and race nutrition plans and that paid off. I ran just as hard this time, but with more training and better fueling, I stayed quite strong through the end and my tank wasn’t empty when I finished. I feel a need to give an unsolicited shoutout to the C2O Coconut Water sponsors. That cold can of cononut water tasted so good at the finish line that I drank the whole thing right down within seconds. I don’t think I could have tolerated another sip of traditional electrolyte sports drink and I was grateful to have that instead. There were other great treats given out at the finish line too but frankly I could not tolerate eating any solid food. I had exerted myself so hard, left it all out on the course, and — let’s just be real here — I was trying not to throw up. So it was: coconut water = liquid gold; my favorite post-workout protein bar = dirt. 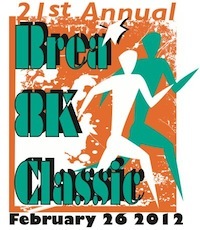 The La Habra 5K/10K is coming up on Saturday, March 23, 2013. So far I’ve stuck to my goal to resist signing up for the race but I can feel my resistance weakening. I got a flyer that offered registration for the 10K for only $15 rather than the regular price of $35. I’ve got 13 miles on the training schedule for that day. Should I run 6.2 of them for the race? Decisions, decisions…. 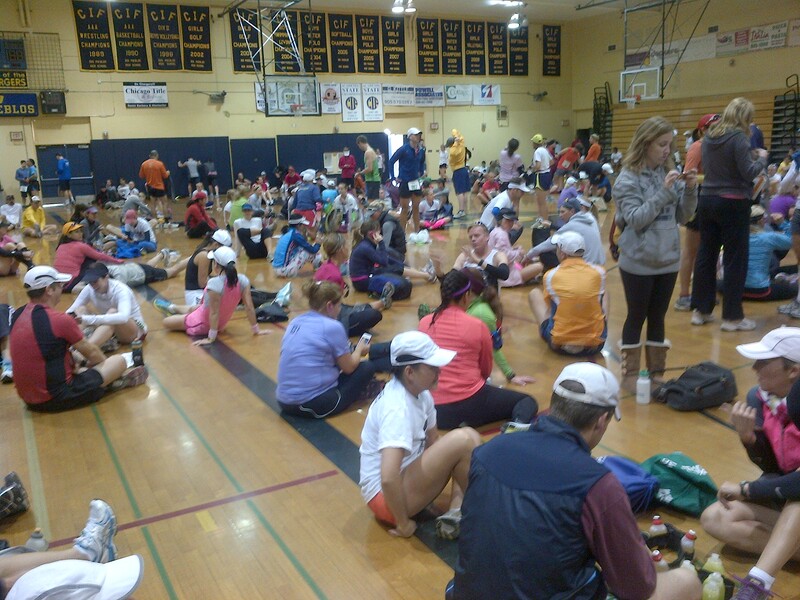 In the meantime, I’m flashing back to my recap of last year’s race. It’s a nice, small-town race to benefit The Children’s Museum at La Habra, the La Habra Concerts in the Park series and the La Habra High School cheerleaders. This year the organizers have hired a new chip timing company to replace the problematic one from last year. One of the really nice things about this race is that it offers childcare for children ages 2-13 while their parents race. I am super happy with the race. No injury, and the best time I hoped for. It’s a new PR over my 10K triathlon time, which at first seemed like a slam dunk given I wouldn’t have to swim and bike first, but then I was worried with how hilly the course was and how my leg had been bothering me. I set my alarm this morning for 5:30 a.m. I got about 7 hours of sleep. The night before I had prepared coffee and oatmeal and a banana and I ate those right away so I’d have a couple of hours to digest them before the race. I’d laid out all my clothes and gear too. I got dressed in plenty of time and remembered my GPS running watch and chip timer. The race didn’t start until 7:50. I parked at the nearby Vons and, after using the nice bathrooms there, I walked to the race start at Fashion Square as a warm-up, then ran in the parking lot a bit to get the stiffness out. When I arrived the 5K people were just getting ready to start, and then it was our turn about 15 minutes later. Small crowd, very mellow, but a well-marked and well-staffed race. Tons of police officers to direct traffic on the course. I was grateful for them. I had lined up toward the front, maybe five to six rows of people back, and it was right where I should have been. I didn’t have to dodge many people on the way up the first hill and I never felt slowed down. I took off a little fast at the start but soon settled in. The fast 10Kers quickly caught up with the 5K walkers. That wasn’t ideal but the course was plenty wide and it didn’t cause a bottleneck, thank goodness. The hills were tough. It’s basically uphill for the first 1.8 miles and then downhill the next 1.3 miles. I did the first 5K loop in 25:22.9 minutes (about 48 seconds slower than my November 5K race) and the second 5K loop in a 26:00.4 minutes. I used the handheld water bottle my friend Holly had given me and it was perfect for the 10K distance. I loved having the GPS watch — it told me when I was on pace or not. I am a bit amazed that a nighttime 4-mile training run on the treadmill at 6 miles per hour that feels tough can translate to a 6.2 mile race at 7.25 miles per hour. Adrenaline, caffeine, time of day, rest and training, all paying off. After the race, while I waited for my official time, I jogged super slowly around the parking lot for a couple of miles, and walked some more after that. Combine that with my warmup in the morning and I got in the extra 2.8 miles of training needed for the 9-mile half marathon training I missed that morning. The results took nearly an hour to post. It was neat to be able to look them up on a computer at the race booth. Those results said I came in 2nd out of 17, but when I went to get my medal the official results said I got first! I was surprised but not too surprised because earlier I had heard them announce the 5K overall male and female winners and they actually goofed up the winners and had to revise it. So uncool! When I got home at 10, my 3-year-old saw me through the sliding glass door and she said, “You got a golden medal!” My 7-year-old said, “I knew it! I knew it! I knew you’d get first place!” Mike reported that the girls had had a debate about whether I would win the whole race. My 7-year-old knew it was possible I could get a medal in my age group. It was just fantastic to be greeted enthusiastically by my family when I got home. Mike was amazed with how well I’d done. He was worried I would exacerbate my injury and he’d been counseling me to go slow. It’s nearly impossible for me to do that in a race. I do not want to tank my chances to even compete in the half marathon, but I listened to my body and pushed as hard as I felt comfortable, and I got lucky. 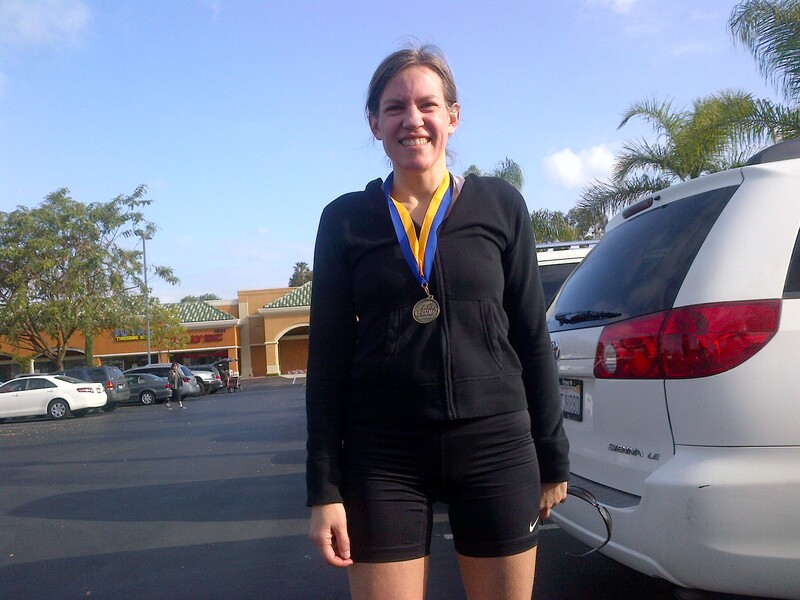 With the 2013 Brea 8K coming up on Sunday, February 24, I’m flashing back to my experience at last year’s race. To give you some context, I’d been running for 11 months at that point. I was 40 years young. I’d done a few 5Ks, a sprint triathlon, and an Olympic distance triathlon. I had just started training for my first half marathon, and I was recovering from a groin strain injury in my right leg. I went to bed at 10 p.m. and got up at 6 a.m. to get ready to race. I left the house at 7:15 and got there at 7:30 for an 8 a.m. start time, cutting it a little close given the line at the porta potties! But I had time to make it to the start line with a few minutes to spare and I happened to meet up with my half marathon running coach Stephanie. She is so nice. She chided me for running the full 6 training miles yesterday and said I only should have done two. 🙂 She also coached me on how to protect my pulled groin muscle from further injury — she told me not to lengthen my stride when I went up the hills — to keep my stride quick and short and not overtax that muscle. Good advice. I felt great during and after the race. There were 4,500 people registered for the race [2,853 finishers I found out later] and even though I stood with the 7-8 minute mile starters, there were tons of walkers and beginning runners who stood there too and should not have been there. I did a lot of passing for the first two miles of the race. Frustrating. I made a mistake trying to pass someone too, totally my fault but she made me feel bad about it. She was listening to her music and couldn’t hear me overtaking her on the right, and while it’s my duty to keep out of her way as I overtook her, I thought she knew I was there. My bad. I said, “Sorry, sorry!” and she said, “Yeah you better be sorry.” I didn’t feel quite so sorry after that! 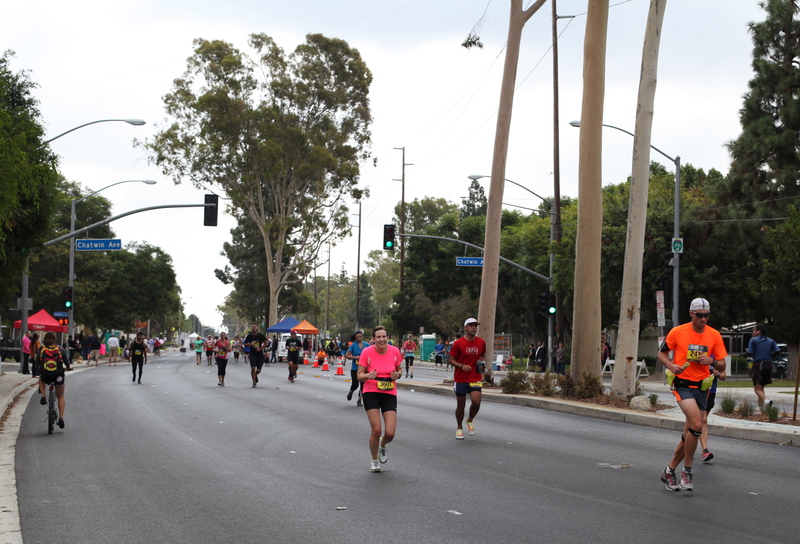 The course starts on a straightaway and makes a loop through a business district by the Brea Mall but then turns into the suburban neighborhood. There were some slight hills but I would not call the course challenging (aside from the fact that an 8K is 4.97 miles of course!) There were plenty of spectators and some funny official race sponsor signs. I was cheered on by Mike and the girls. They showed up to surprise me on their way to go skiing for the day. First they drove by right around mile 2, and then they pulled over and stood on the sidelines to cheer for me. That was so nice! Mike saw a couple of his co-workers too. My chip time was 41:55 for a pace of 8:21 per mile and an average 7.17 miles per hour. Not bad for an injured, tired woman! At the end of the race someone called my name and I turned around to see Mike’s co-worker Jennifer. He didn’t even know she was running the race so I was surprised to see her there and so very glad I remembered her name. 🙂 We enjoyed the post-race food — quite the spread of vendors. I had a banana, oranges, water, a slice of BJ’s pizza and a small Jamba Juice strawberry-banana smoothie. I started to get really cold as the sweat evaporated off my running shirt, and I took that as my cue to drag myself away from all the free finish line goodies and head home. All in all it was a great experience and I’m glad I signed up for the race again this year! Who’s in it with me? 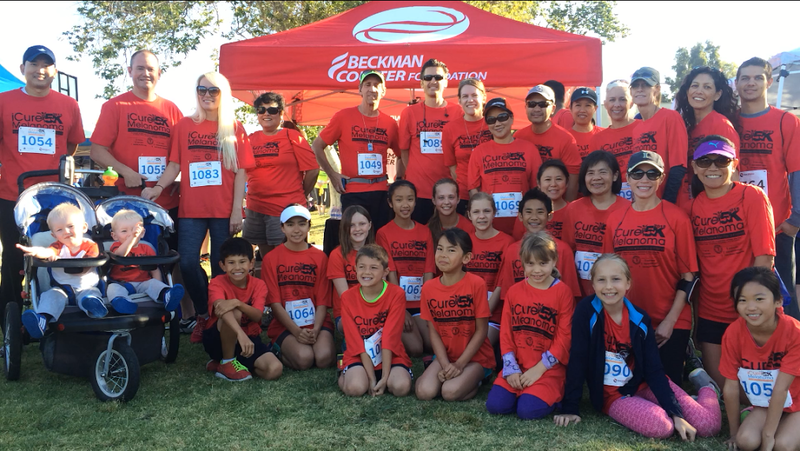 If you’re interested in the 2013 Brea 8K, take advantage of the 10% off discount code from the Race Grader coupon code page (scroll down to the Brea 8K entry and create a free Race Grader account if you do not already have one)!